As a stay at home mom every day I have to find something new to keep the interest of my two kids. With school work, house work, and a million pets running around, my brain can get a little uncreative and tired as the day goes on. Unfortunately “mommy wants to just lay on the couch” doesn’t translate very well to a 2 year old. It ends up in questions like… Why? Why? Whhhhhhhhhy? 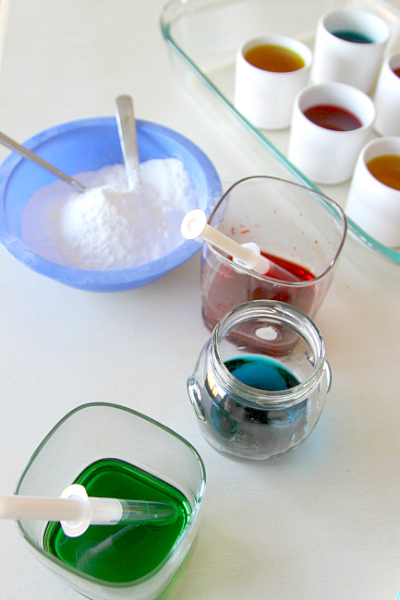 Which is why when I was adding to my Rainbow Crafting Pinterest Board and a blogger friend of mine showed me a post of hers called 10 Baking Soda Experiments, I got really excited! That day was a little trying for me with the kids getting on each others nerves, so I decided to get up, drag everyone to the kitchen and create some playtime. We went through 2 boxes of Baking Soda and FOUR bottles of Vinegar playing over and over again. My house smelled like Easter Eggs for two days. But it was fun! We did a few things different than Jen did on her experiment but I want to make it clear that it was her post that got me up to play, so please visit her as well. She has more than I have listed here, so you can play all week long! 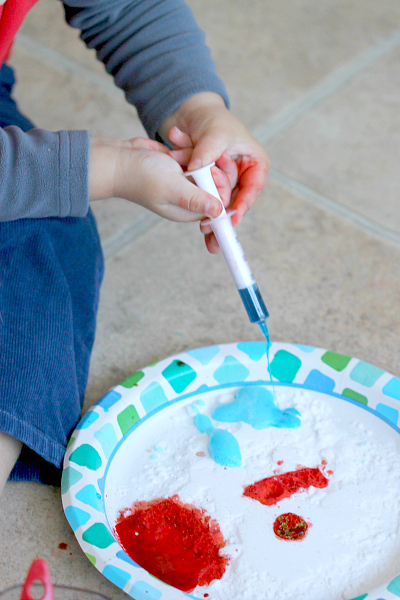 To do this super fun playtime experiment, you will need to have no needle syringes and a massive bag of baking soda. 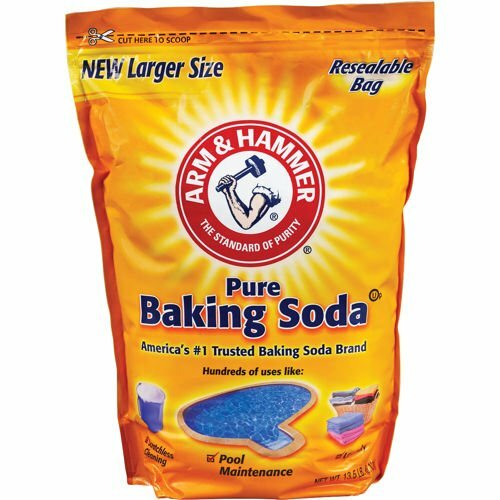 We went through a ton of baking soda playing over and over again so I recommend grabbing this bag from Amazon. I have never found it in the store and its pretty versityle, so I like having it on hand for other playtime, bath bombs, and of course cleaning. If you do not have any no needle (medicine) syringes laying around, you can also pick some up. First I gathered four paper plates and filled up with baking soda. 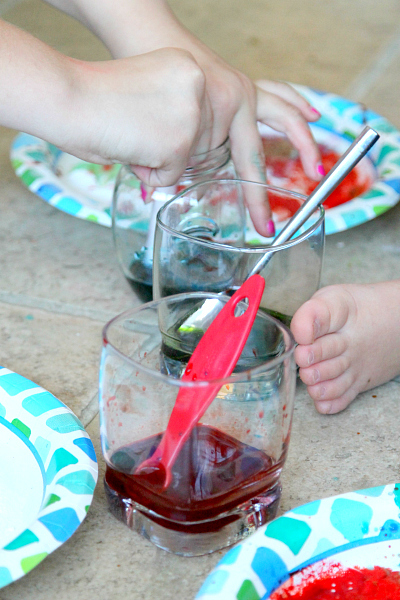 Then I added white cider vinegar into tiny cups and a few drops of food coloring dye. I set up the Baking Soda station on the floor in the dining room and added some old medicine syringes, tiny measuring cups and spoons for the kids. Then I showed them both how to add the colored vinegar to the baking soda to watch it bubble up! This worked great for both of my kids. 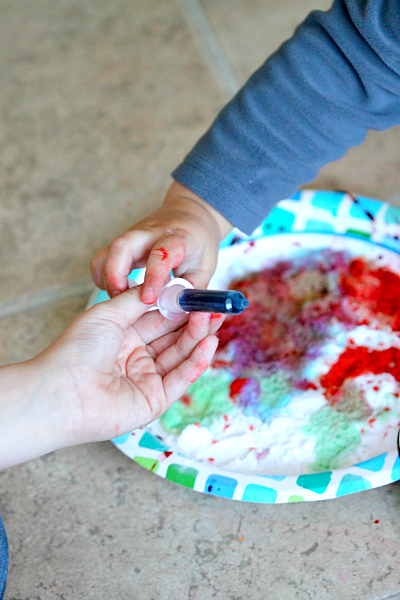 My son, 2, got some great dexterity in with the syringe, my daughter, 8, enjoyed the science and fun of it, and they both got to act like a team! Best of all the fun lasted for quite some time and was very inexpensive as we just used what was already in the kitchen. The kids also wanted to add their own take on it by adding glitter, so why not! The glitter bubbled right along with the vinegar! Also, a great tip that Charlotte discovered is that you can take the syringe and put it in a hill of baking soda and once its “injected” will bubble up in another place. We also did another experiential that was just as fun that I will update in another post. I wanted to encourage you to forget about the mess and take the kids to the kitchen. 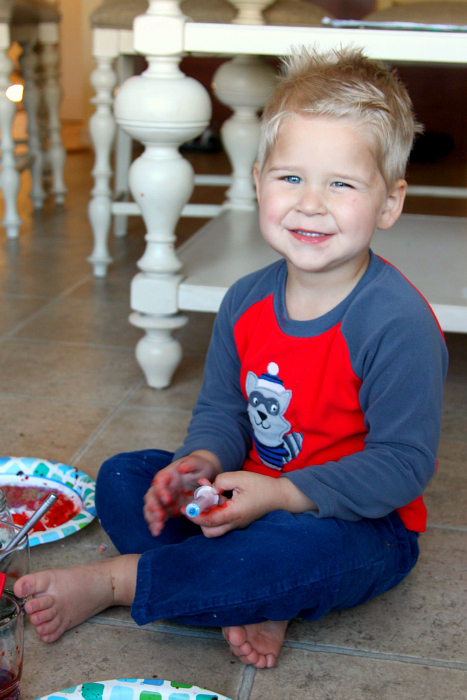 Getting active with your kids is a great way to get through the day as a parent!